US State Department spokesman Mark Toner has threatened the penurious West African state with a staunch diplomatic and financial embargo if power is not returned to ousted Malian President Amadou Toumani Toure within seventy-two hours. While half the population lives on less than $1.25 per day , the imposition of economic sanctions to the landlocked import-reliant nation will inevitably lead to greater social instability and civil unrest. As the prospects of embargo work to further nurture war-like conditions amid longstanding poverty, the ECOWAS bloc has put its troops on standby near Mali’s borders, ready to intervene should the situation deteriorate. During the 2010 – 2011 crisis in Côte d’Ivoire, forces loyal to the French-backed Alassane Ouattara undertook a widespread campaign of atrocities against civilians , a further reminder of the danger posed by the international community’s rush to military intervention in crisis stricken regions of Africa. As the United States and others espouse the importance of returning to constitutional order while Malians offer their support to the junta, the strength of Mali’s touted democratic institutions appear highly questionably. 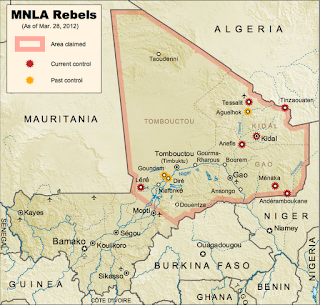 The primary justification behind the coup came from the civilian government’s inadequate response to an ongoing campaign of Tuareg separatism in northern Mali, although the recent disarray in Bamako has prompted the steady advance of armed Tuareg militias southward. 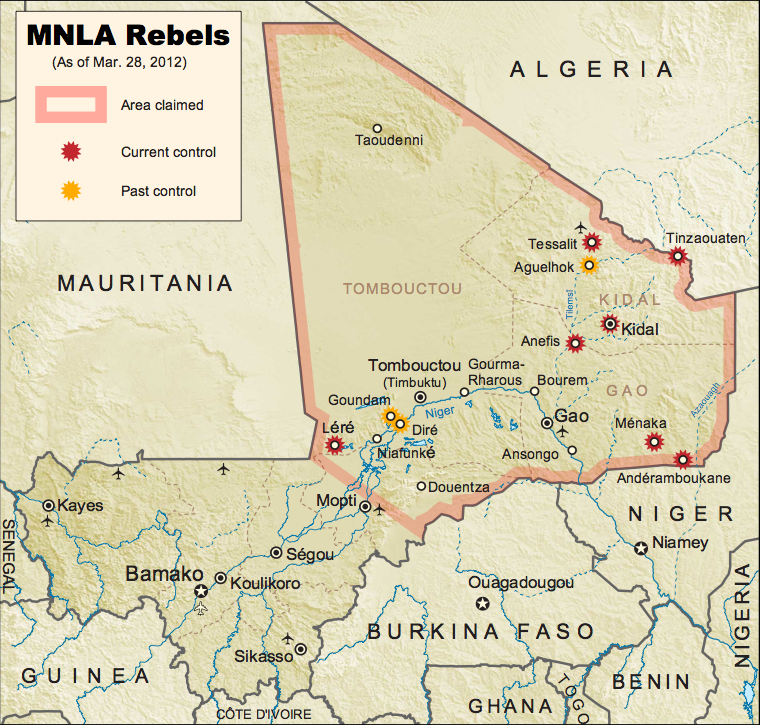 Under the banner of the National Movement for the Liberation of Azawad (MNLA), armed militias have reportedly seized the northeastern region of Kidal, prompting the poorly equipped Malian army to abandon its strategic northward positions. The Tuareg are a traditionally nomadic and pastoralist ethnic minority group of some 1.5 million people who seek to secede from the Malian republic and form an independent nation called Azawad; the group has traditionally existed in a territory scattered across the Sahel and Sahara countries largely operated by al-Qaeda in the Islamic Maghreb (AQIM). The presence of a second Tuareg-dominated separatist group, Ancar Dine further complicates the situation; the movement seeks to impose sharia law throughout northern Mali and is led by Iyad Ag Ghaly, a prominent Salafi figure thought to have links with a branch of Ayman al-Zawahiri’s AQIM, led by his cousin Hamada Ag Hama. As separatists now control a third of Mali, a food crisis is approaching over Sahel-Saharan Africa as nearly eighty thousand refugees seek amnesty in neighboring Algeria, Niger, Mauritania and Burkina Faso. As the militant Ancar Dine appear to be claiming to control over regions previously attributed to the MNLA , their advance may have wider implications, capable of drastically fomenting regional instability. An influx of refugees will put further strain on Algeria and Niger, with a heightened prospect for widespread uprisings seen during the Arab Spring unfolding in the Sahel region. Algeria may be further destabilized if the security situation continues to deteriorate in Mali, as France may feel compelled to intervene in the affairs of its former colonial holdings, as seen tragically in Côte d’Ivoire. The crisis in Mali bears a striking parallel to events in Nigeria, a nation struggling with the Islamic insurgent activities of separatist Boko Haram to its north. Given the political instability in Abuja, a coup orchestrated by low-ranking officers against Nigerian president Goodluck Jonathan based on the Malian model would not be unthinkable. As the World Bank and African Development Bank suspend all aid to Mali, some form of military intervention is conceivable if the UNSC’s calls for the “immediate restoration of constitutional rule and the democratically elected government” are not heeded . As Mali’s neighbors threaten to use sanctions and military force to depose the current Committee for the Re-establishment of Democracy and the Restoration of the State (CNRDR) led by Captain Amadou Sanogo , the junta has unveiled a new constitution guaranteeing freedom of speech, thought and movement . Sanogo vowed not to cling to power and to set up democratic elections when the Tuareg insurgency can be contained; those who took part in the coup would be barred from participation in the elections . The influx of arms from NATO’s regime change programme in Libya has created dire prospects for a heavily armed civil war in Mali; it remains to be seen how the NATO bloc will react if the CNRDR refuses calls to step down and engages in a drawn-out conflict with Islamist separatists. As the US military counters the Lord’s Resistance Army by expanding its military presence through AFRICOM (United States Africa Command) in the Democratic People’s Republic of the Congo, the worsening situation in both Mali and Nigeria provide further justification for foreign intervention and war profiteering. Nile Bowie is an independent writer and photojournalist based in Kuala Lumpur, Malaysia.